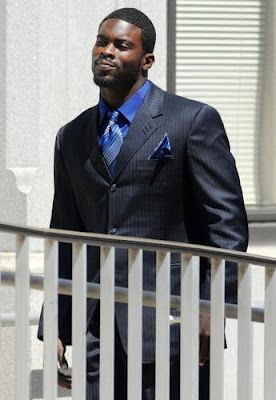 An Opinion On Sports: Michael Vick: What Money? I read today that Michael Vick filed Chapter 11. He lists his debts between $10 million and $50 million. Mike, could you narrow that down for us a bit? His assets are also in that $40 million range. I suppose it's much easier for me to know if I have $100 or $500 in my checking account. (But at least I know!) That $400 range is much easier to keep up with than that $40 million range! When asked if Michael was 'broke' or insolvent, his attorney replied that he was in "a precarious financial position". You mean sorta like O.J.? This is the point I think you'll find intriguing: Vick wants the court to approve the appointment of a guy named Talbot to manage his financial affairs during this period. Now this David Talbot was once a medical doctor, turned financial planner, turned management consultant. He is mentioned as a "trusted advisor." Now, with part of that huge asset range, Michael has paid the guy up front with a Mercedes Benz and $35,000. Wait, there's more: Talbot also gets $15,000 a month plus expenses until the case is closed. And Michael, the Dude doesn't have to pay any malpractice insurance! If too many MD's get wind of this, they'll all become financial guys. No more prostate checks for these white coats! But in cases like Michael Vick, they'll be working with a sickness of a different sort. Here is a guy who was paid so much money that he doesn't even know how much he is or isn't worth to toss a piece of pigskin around on Sunday afternoons, and claims he cannot honor his debts unless the creditors agree to settle for less. I'm supposed to buy in to that? I'm supposed to feel bad for the guy? Not when I know that after he is released from prison he will be spending money with no regard for its value again. We've seen it happen before (reference Mr. Simpson again: just ask his victim's families). He wore that #7, and he'll roll that lucky seven on and on. Mr. Talbot will still have his Mercedes, and you and I may or may not still have our physicians!